Throwing you back to 1975 this week. 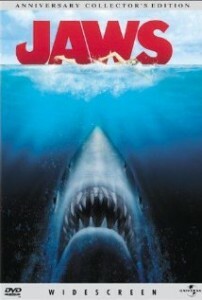 This entry was posted in Uncategorized and tagged 70s movies, Jaws, Lynn Rush, Sharks, Throwback Thursdays by Lynn Rush. Bookmark the permalink. Have a great weekend, Lynn. I don’t know about you, but what a week?!? I never saw Jaws. Can you believe it?! I was afraid to go near the bathroom after that movie!